As most of you know, I enjoy participating in Alpaca shows…I think I’ve learned a lot from both halter shows and fleece shows. I often hear other exhibitors express confusion or dismay over their placings - “Well, I thought he was a really nice boy…can’t figure out why we only got fourth place!” We’ve all had those moments. But I have come to realize that in the current development of the North American alpaca herd, the difference between first place and sixth place is becoming narrower and narrower. I recently entered two white fleeces in a medium sized fleece show. I love both of these boys, they are the same age, both bright white, dense, crimpy, fine and sweet dispositions and I have always been hard pressed to pick which is the better of the two. They competed in halter classes but never at the same show – I just hate to have two animals competing against each other in a halter class – that’s just me, I just don’t like to do it. But there’s less pain with a fleece show because it all happens behind closed doors – there’s no agony while the judge makes her decision, there’s no room full of people looking on. But I am really glad I put these two fleeces in side by side as it were – I learned a valuable lesson. One fleece placed 2nd out of eleven and one placed 6th. Same class – white yearling males. Would you like to know how many points divided them? Two…two points! Still…2 points – I really wanted to know what I had missed on Baloo – I thought they were closer than that. 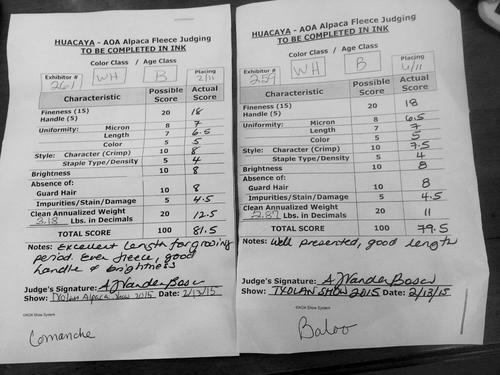 So I looked at their individual scores – that is the very best thing about fleece shows – it’s all there in black and white – what the judge saw, what he liked, what he didn’t like. And fleece scores are not predicated on comparison to the other entries in the class – fleeces are judged on what the industry holds as ideal. Sooo – fineness and handle…same score, length, half a point difference, micron, half a point difference the other way…so we’re even again. Color, same…they are both white with no color contamination. Character (that deals with the architecture of the fleece, crimp style, organization of the staples…that sort of thing) half a point but both good scores, density, same score. Absence of Guard Hair – same score, 8, Impurities and Stains – good, same. Weight – ah ha – here we go…1 ½ of those points was due to weight differential. Poor Baloo is a bit of a Pigpen and I had to skirt a lot of his tail feathers – beautiful fiber but oh so dirty! So, basically my original assessment of these boys was correct – they are both gorgeous and there is not much difference in their fleeces (huge difference in their personalities – Baloo is the class clown, Comanche is very dignified) but the weight score made the difference between 2nd place and sixth place. So my advice to all exhibitors – take the time to go look at the animals that placed higher than yours…and be objective. And if you really can’t see why the judge placed that animal over yours, take the time to talk to the judge at the end of the show, or ask another experienced breeder to look at both animals and give you an opinion. And don’t quit showing that animal. If it placed you are probably correct to think it is show quality – we’ve done an excellent job here is the US over the past few years in improving the quality of the animals we are producing. I go to shows and my head wants to explode – there are so many gorgeous creatures there. And the difference between first and sixth is usually very hard to find. 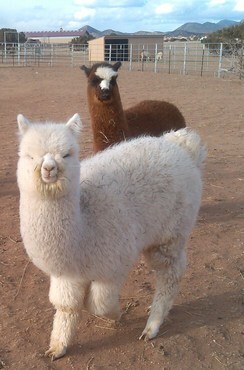 I wouldn’t have the job of alpaca judge for all the tea in China! Click the picture below to see the score sheets!